Did you know astrology provides many insights into Halloween and its traditions? 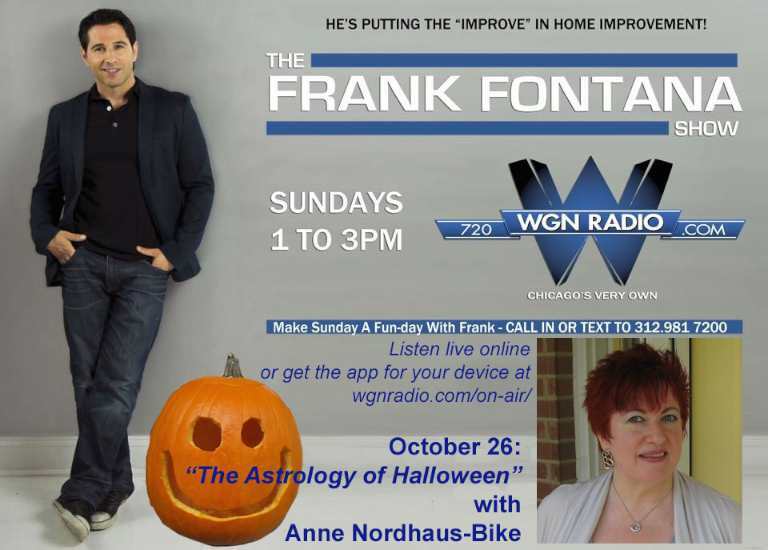 Anne will return to WGN Radio AM 720 Chicago this Sunday, October 26, to talk about the astrology of Halloween on the Frank Fontana Show, airing from 1 to 3 p.m.
Halloween always comes during the Scorpio time of year, and Anne will talk about that sign’s strong astrological energy. “We all become honorary Scorpios for a month in late October and most of November,” she explained. “So we’ll be discussing what Scorpio energy means for all of us. If time allows, Anne and Frank also will talk about the lost continent of Lemuria—the lesser known Pacific Ocean counterpart of the lost continent of Atlantis—and its connection with this time of year. “According to mystics and sages down through the ages, Lemuria was a very mystical place, tapped into the symbolism of astrology, so we’ll share some insight about this interesting but often forgotten land with listeners,” Anne added. Listeners will be welcome to text or call in with questions and comments at (312) 981-7200. Hear the show by tuning in WGN Radio at AM 720 in Chicago. Or listen online from anywhere in the world by going to http://wgnradio.com/on-air/. Or listen on your smartphone or other mobile device with the WGN Radio app, available for both Android and Apple devices; to get the app, go to http://wgnradio.com/on-air/ and choose the link for your device.